MERCI Encore! Yes, this helps. I really want to work with stations this year, however I was bogged down creating “game manipulatives” for so many students. Now I can reduce the amount of manipulatives I have by incorporating them into stations rather than into groups for all my students to work on at the same time. 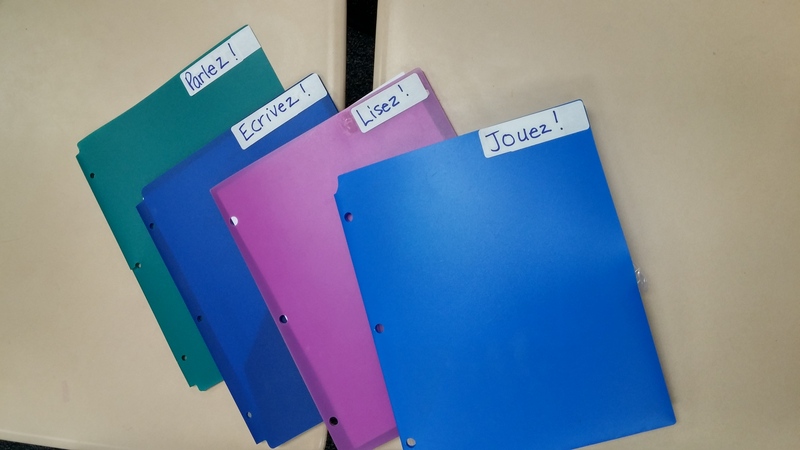 The pictures of how you organize the folders, etc is helpful. 1. How do you store/ locate all your station materials for all levels 1-5? 2. 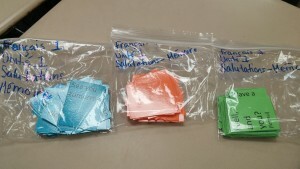 Then how do remember you have these station games/activities for each level and each unit. Hi, Laura (I apologize in advance if you end up getting 3 replies from me, I’m having technological problems!) Anyway, I have a file folder for each unit in my file cabinet and throw everything I need in there. 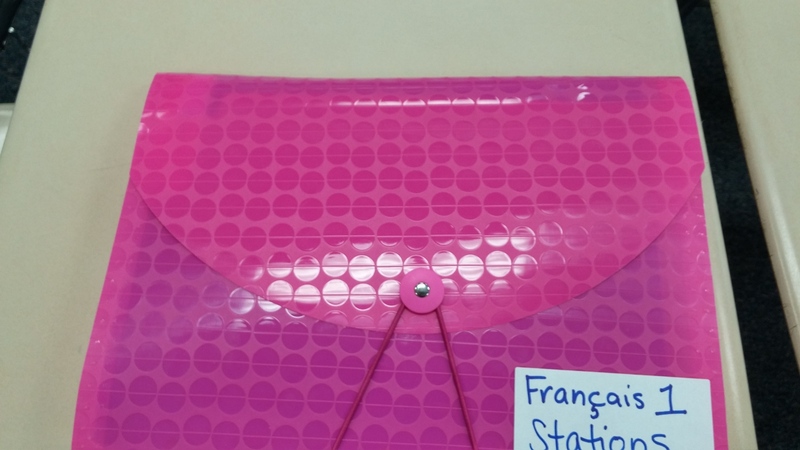 My French I drawer is especially ugly because of the manipulatives (I use a lot fewer manipulatives in upper levels.) I can keep track of what I have fairly easily, because I can look in the folder or at my packet from the previous years. I’m sure other readers have much better organization systems than I do! Merci pour toutes ces idées super! Ma question est de savoir comment et si vous présentez les stations et activités aux élèves avant qu’ils commencent? Sorry for the English–I’m on my phone and it’s a little easier. Yes, I spend a few minutes showing the students what they’ll be doing at each station before having them get started. Thank you for all the information! It really helps, especially since I am the only French teacher at my school so I don’t always have someone to collaborate with! I was wondering how you usually go about introducing the vocabulary to students. Last year was my first year teaching French and I noticed that vocabulary was a struggle because they never seemed to retain it, even when I spent a considerable time each day introducing it or reviewing it. I’d love some new ideas! If you don’t give them any kinds of “vocab lists”, how do you assess their performance/mastery of the required vocabulary to achieve the can-do statements? This whole approach is so far from how I run my class, it baffles me. Great question. I give them an IPA at the end of the unit that assesses them on the Can-Do’s. I’ll post the IPA for this unit in the next day or two. I also assess them formatively on the daily tasks (in the packet.) I couldn’t possibly grade everything, but I grade as much as I can so they have feedback.